“Your Inner Fish” cover. Tiktaalik roseae illustration by Kalliopi Monoyios, based on fossils discovered by Shubin and colleagues. Tiktaalik is considered a transitional evolutionary step between fish and land animals. Are plants responsible for our color vision? Niel Shubin’s “Your Inner Fish: A Journey into the 3.5-Billion-Year History of the Human Body” is an engaging exploration of evolution through a personal lens: our own bodies. Shubin creatively connects us to all past and present life by revealing the evolutionary history of the body. It’s a fun read with just enough technical detail to provide insight without bogging the reader down in the esoteric. While “Your Inner Fish” focuses on the shared evolutionary history of animals, the connection in the book that most struck me illustrates a relationship between plants and primates: the influence plants have had on our color vision. Humans and our closest living relatives, the Old World monkeys (Cercopithecidae), have three different cone-shaped cells called color receptors carpeting the surface of the retina. These receptors play an important role in color perception. Currently, two complementary theories are accepted in visual physiology: the trichromatic and opponent process theories. The trichromatic theory states that cones are specialized for either red, green, or blue wavelengths of light. The opponent process theory states that our eyes and brain interpret colors antagonistically: red vs. green, blue vs. yellow, black vs. white. Using these theories, we can make a rough estimate of the numbers of colors we see: a few hundred spectral colors and all mixtures and dilutions of those colors. When spectral colors are mixed and/or diluted with white light, a wide range of the colors are generated- that’s a lot of color! Generally speaking, the more receptors an animal has, the more detailed the color vision, though cases like the mantis shrimp (Stomatopoda) have shown that a wide variety of receptors does not necessarily mean more colors are perceived. Most mammals have only two receptors: dogs see in yellows, blues, and grays. Cats probably see in blues and grays. On the other hand, birds see a range of colors we can only fail to imagine- and not for lack of trying. Birds have four receptors (red, green, blue, and ultraviolet), more cones in their eyes than mammals, and an oil droplet in each cone which may serve to distinguish even more colors. Bird vision is incredible! Vision is complicated, but usually follows the pattern of the more receptors, the more colors perceived. Of our three receptors, two are structurally and genetically very similar to one type of cone in other mammals. Shubin explains that this indicates a common ancestry for these two cones: early in the history of Old World monkey color vision, the genes responsible for the original receptor duplicated, resulting in two identical cones. Over time, the two cones would diverge as random mutations accumulated during the process of DNA replication. If environmental pressures neither rewarded nor punished changes in color perception, the divergence would be random, a slow accumulation as time passed. This process is referred to as genetic drift. The common plan for all limbs. Illustrated by Kalliopi Monoyios. Alternatively, if something in the environment conferred increased fitness to monkeys with better color vision, the cones would be more likely to diverge rapidly, pushed to specialize for different wavelengths. An enhanced ability to perceive a range of colors would probably have benefited our monkey ancestors. Monkeys with three color receptors could easily select “the most nutritious” of the plants available (Shubin pg. 154) based on color, outperforming those with two receptors. Increased feeding would promote an increase in reproductive rate, upping the percentage of monkeys in the population with three genotypically and phenotypically distinct cones. For this theory to stand, plant life would need to display a significantly diverse range of colors to warrant specialized identification skills. Were plants diverse enough to infer increased fitness to Old World monkeys with better color vision when those genes first duplicated? Shubin reveals that based on comparisons to other monkeys with color vision, the three receptor system is estimated to have arisen about 55 million years ago (Eocene epoch of the Tertiary Period). The fossil record documents another change to life on Earth during the Eocene: a shift from fig and palm dominated forests to something much more diverse and, in all likelihood, more colorful. The development of the 3 receptor system does indeed correlate with “a switch from a monochromatic forest to one with a richer palette of colors in food” (Shubin pg. 154). Wanting to know more, I dug deeper into the Eocene. This epoch occurred 56.0-33.9 million years ago (Ma) and is marked by the highest mean annual temperatures of the entire Cenozoic Era, the result of the Paleocene-Eocene Thermal Maximum (PETM) around 55 Ma during the Ypresian subdivision (56.0–47.8 Ma). At this time, about 2,000 gigatonnes of carbon was released into the atmosphere, warming the Earth abruptly and intensely. The source of the carbon is unclear, but it’s speculated to have resulted from sediments on the ocean floor releasing methane (which oxidized to carbon dioxide in the atmosphere), decomposition of organic matter on land, and/or the release of methane during volcanic activity. The Eocene was a period of intense global warming! The PETM allowed many plants to expand their ranges, especially tropical and subtropical species. During the Eocene, landmasses were largely situated where they are today, giving us an interesting look into the landscapes of the period: fossils found in the polar regions include alligators, turtles, and flying lemurs. Palm trees were found as far north as Alaska! Such range expansions seem likely to promote speciation, the evolution of new species. In fact, the earliest known nightshade is found from 52 Ma and the first fossil evidence of orchids, the pollinia, is attached to a gnat in amber from this period. The pollen record of Colombia indicates speciation and few extinctions occurred at the time. Though we can’t say with any certainty, plants appear to have speciated and flourished following the PETM! Gauguin’s Armchair by Vincent van Gogh. A lantern illuminates a red wooden chair with a green stripped cushion, a patterned carpet and a green wall. Because our ancestors likely adapted to increased plant diversity with improved color vision, we apparently have our ancient relationship with plants to thank for the rich colors we see today. What would life be without the reflection of a fiery sunset in flowing water? Without rainbows of summer wildflowers rippling through the grassy sea of a prairie? Such thoughts lead me to another question: how have we and other animals influenced the evolution of color in plants? Our visual anatomy and physiology make the colors red and green “complementary” or “opposite” colors, causing a strong and vibrant contrast between the two. Complementary colors have a certain synergy together. 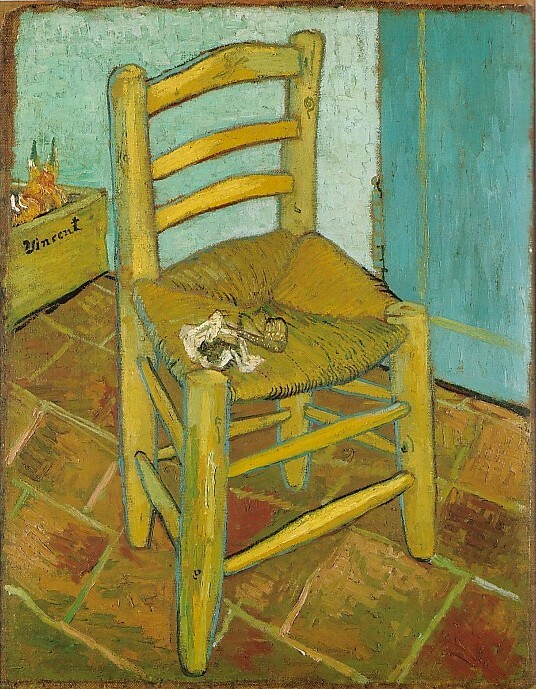 A classic example is Vincent van Gogh’s painting, Gauguin’s Armchair. There’s dimension to the painting it would lack without the complement between the red and greens of the wall, wood, cushion, and floor. Because they evoke more of a physical response from us than other color combinations, complimentary colors are powerful pieces in an artist’s toolkit. Artists are encouraged to employ van Gogh’s technique, mindfully choosing color combinations to achieve a desired affect. He created a complimentary set of chair paintings: Gauguin’s Armchair andVincent’s Chair with his Pipe, which plays with the compliments between orange and blue. What relationship does van Gogh’s use of complimentary colors and a plants’ use of complimentary colors have? Are they related? Knowing what we do about our predilections for complimentary colors, would it be reasonable to theorize that a plant living in range of ancient Old World monkeys would be rewarded for making red pigmented fruits? Those monkeys may have been developing an affinity with the contrast between red and green, precursors to our perception today. Hungry monkeys would easily locate red fruits in a sea of green, consuming more fruits and transporting more seeds than if they had to search for drab fruits. They would leave more “red seeds” than “drab seeds” behind in their droppings, facilitating the spread of trees producing red pigments. While we can’t know what happened 55 million years ago with any detail, we can imagine what it was like by referencing modern research into plant pigments. Two bright red fruits complements the fountains of opposite leaves. Developing rose hip of Rosa woodsii var. arizonica (Wood’s rose, Rosaceae family). Yummy strawberry from my mom’s garden. The genus Frageria is in the Rosaceae family. A prolific Ribes cereum shrub (wax currant, Grossulariaceae family). A lovely display of asparagus fruits (Asparagaceae). A fruiting cholla, Cylindropuntia sp. Cylindropuntia is in the Cactaceae family. What type of research on plant pigments is the most extensive? Kevin C. Burn’s 2015 article in Frontiers in Ecology and Evolution notes that research into plant pigment response to biotic factors has focused heavily and rather unsurprisingly on flowers. But like any hungry monkey, I’m interested in the fruits! Fruit research has primarily been done on the bird-dispersed species salmonberry, Rubus spectabilis (Rosaceae). Like us, birds can easily pick out red from green and research shows that they’re attracted to that contrast. Research also shows that animals like birds do affect fruit color in plant populations, but biotic factors never prove to be the primary selection pressure on flower and fruit color. What else is influencing plant reproductive pigmentation? UV exposure could be one factor. Research has documented changes in UV-absorbing pigment levels in Argentina anserina (Rosaceae) and other species across vast ranges. For example, UV-absorbing pigments tend to increase towards the equatorial tropics. Burns points out that while the UV-absorbing pigments could be used to signal to insects, they could also protect gametes from the increased UV exposure at lower latitudes. This inspired Burns to research the color-polymorphic fruits of R. spectabilis. Color-polymorphism means multiple color variations occur within one species as a result of genetic variation: in salmonberry, fruits are either red or orange. Red fruits attract more birds, are abundant at higher latitudes, and are slightly smaller than orange fruits. Burns compared the desiccation rates and spectrographic analyses of the two fruit variants on Vancouver Island in Canada. Red (left) and orange (right) fruits of R. spectabilis. The results of Burns two part experiment provide insight into abiotic effects on fruit color. His spectrographic analyses (using a USB Ocean Optics 2000 spectroradiometer) showed that the “red fruits had greater visual contrasts with their natural backgrounds than orange fruits, indicating they are more conspicuous to bird.” In his desiccation experiment, he left fruits clipped from bushes in a sunny aquarium, weighing them before and after a period of 24 hours. His results showed significantly more water loss in red fruits. From this data we can suppose orange fruits loose less water than red fruits, persisting longer on parent plants under arid conditions. As Burns points, out, the experiment doesn’t take into account different light conditions, resources available to parent plants, or morphological factors like cuticle thickness- but it provides a general idea of comparative desiccation rates between the varieties. Red fruits are more attractive to birds and dry out faster than orange fruits. What does this mean for the plants? There appears to be a trade-off between resistance to desiccation and attraction to birds, shedding light on the difference in habitat between the two variants: red fruits grow in cooler, wetter locations, while orange fruits live in lower, drier latitudes where UV exposure is higher. At lower latitudes, it seems likely that red fruits would dry up before birds got to them. Plants are required to produce orange fruits that last longer but that also take birds longer to locate. This interpretation of the data is repeated in other studies Burns mentions: “red arils produced by an Australian acacia (Acacia ligulata) were more common at cooler, wetter sites, whereas orange arils were more prevalent in hotter, dryer sites.” Across their range, R. spectabilis plants must live with a trade-off between attraction to birds for seed dispersal and ability to withstand aridity and UV exposure. In all likelihood, our ancestors were influencing the plant life around them just as birds today influence R. spectabilis. Plants influenced us and are in turn influenced by us. Our relationships to the life around us is deep, based on a long history of interactions between these biotic and abiotic players. It’s fascinating and uplifting to think that plants are partially responsible for our color vision. Plants produce such a wide range of engaging colors throughout each season of the year. Next time I smile at my first glimpse of new spring green or pick up my paint brush, I’ll have more than one reason to thank a plant!